Available in Colonial Blue, finished fenders optional. Our friend Sean excitedly texted us one morning with a link to The Gravel Grinder Tour of the Canyons. A 160-mile, mostly self-supported, ride on old roads that stretch from Grand Junction to Moab. This non-technical route is comprised of worn asphalt roads and dirt paths with plenty of elevation gain and steep scenic descents. Our conversation quickly turned to what kind of bicycle would be appropriate for this unique tour. Sean, a loyal Soma Fab customer, had been eyeing the Pescadero frame set for a few months. We all decided it’s specifications were perfectly suited to this trip. The Pescadero’s road-like geometry will allow Sean to quickly accomplish the mountain passes and it’s relaxed head tube height will hold steady on sharp descents. Sean quickly decided to have us pull together the component package for his new Pescadero. Before we began recommending specific components we carefully considered Sean’s bicycling goals, abilities, his height and measurements, and we even talked about the styling details he had in mind. A new bicycle build isn’t the the only way to achieve the perfect bike but it is the most efficient way and we were on our way to the perfect machine for a Rocky Mountain bicycle tour. A new bike build is organized into 4 major categories. The type of wheels are sometimes chosen in conjunction with the frame set. You may know exactly which frame set and/or type of wheel you want for your new bicycle. But if you are open to suggestions we will eagerly outline several options for you to choose from based on your body type and your cycling goals. There are predominately 3 popular wheel diameters to choose from. Sean is most comfortable on 700c wheels so we knew the Pescadero frame set would be a great fit for him. Since he already has several bikes with huskier type of rims paired with plus sized tires we recommended a different wheel style for his Pescadero, something lighter and a bit more aerodynamic. After the wheel diameter is selected it’s time to decide between standard factory built wheels or a special pair of bespoke wheels. Hand built wheels are stronger, hold their true longer, and allow you to choose exactly which rim model, hubs, and type of spokes you prefer. Sean wanted a nice looking pair of wheels that would withstand off road conditions. He decided that the hand built wheel option was the best route for him. The drive train choice varies from an internally geared hub to a traditional drive train with derailleurs. We will help you determine how many gears are necessary for your cycling goals. Sean specifically requested Shimano’s DuraAce 2x10 drivetrain, a very popular choice for road cyclists. 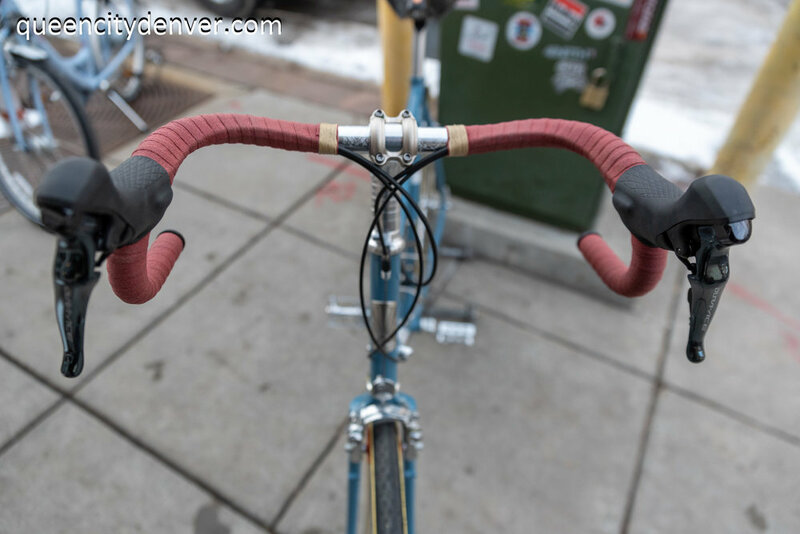 We performed a few modifications to allow it to work smoothly with the Pescadero. 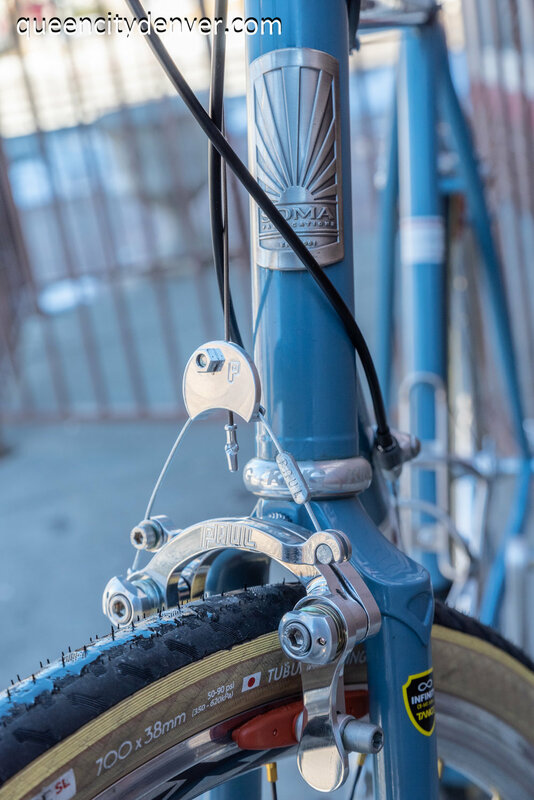 The components that determine your comfort while on the bicycle directly correspond to the cockpit; the handlebars, stem, head tube, and everything you actually touch while riding. We’ll analyze your body measurements to help determine specific recommendations to your frame. These are also the components that can be easily replaced later as your riding style or even your flexibility changes. We were weight conscious with this bike build since Sean will be riding up multiple mountain passes on the Gravel Grinder tour. The weight considerations of each component was carefully balanced with it’s durability and ease of adjustment for Sean while he’s out on tour. In the end Sean’s bike is one of the fastest Pescadero’s I have ever had the pleasure to test ride. It’s light, responsive, and agile. Rims Velocity Quill, polished. These are durable, lightweight, American made rims with an Aerodynamic quality to them. Rim Brakes	Paul Component Engineering Racer Brakes, center pull calipers. Rim brakes are light and more easily maintained out on the trail. They provide substantial stopping power if they are properly adjusted and especially if they are manufactured by Paul Component Engineering. Tires Soma Fab Supple Vitesse. 700 x 38mm tires are the optimal size for the Pescadero frame if you want the option to install fenders. This will be a great all around tire size for any type of dirt riding.